This is a ‘testing the waters’ post … a brief dip back into my blog. Where did I go? What has been happening? And where are all the beads gone? And what is millefiori? The ‘all sorts’ of jewellery making. The candy of creation …. those sparkling, glistening little trinkets. Addiebeads is in transition. Moving from one space to another. No more bead selling and lots more jewellery making. For now millefiori is on my mind and a shift from selling beads to creating and designing an Addiebeads rage of jewellery is underway. Millefiori is an italian glasswork technique which produces distinctive decorative patterns on glassware. The term millefiori is a combination of the Italian words “mille” (thousand) and “fiori” (flowers). The manufacture of these glass beads can be traced back to Roman times and interestingly traces of millefiori have been found in archaeological sites in Ireland as far back as the 8th century. The glass these days is made in Murano which is a tiny little island near Venice. It can be known as either murano glass or venetian glass. The glass is made in cane form (like straws) and then sliced to reveal the intricate patterns inside. They are more like discs than beads and dont have centre holes for threading. Here is an example of what the canes look like before they are ‘sliced’. I have been busy sourcing these tiny little glass flowers and working out the best way to sit them into pendants. There are many different ways of doing this but in order to have the best possible finish this has taken me many months to work out! I am still not sure if I am getting it right! But onwards goes the research! I’ve been researching, designing and refocussing. I am working on a new brand. 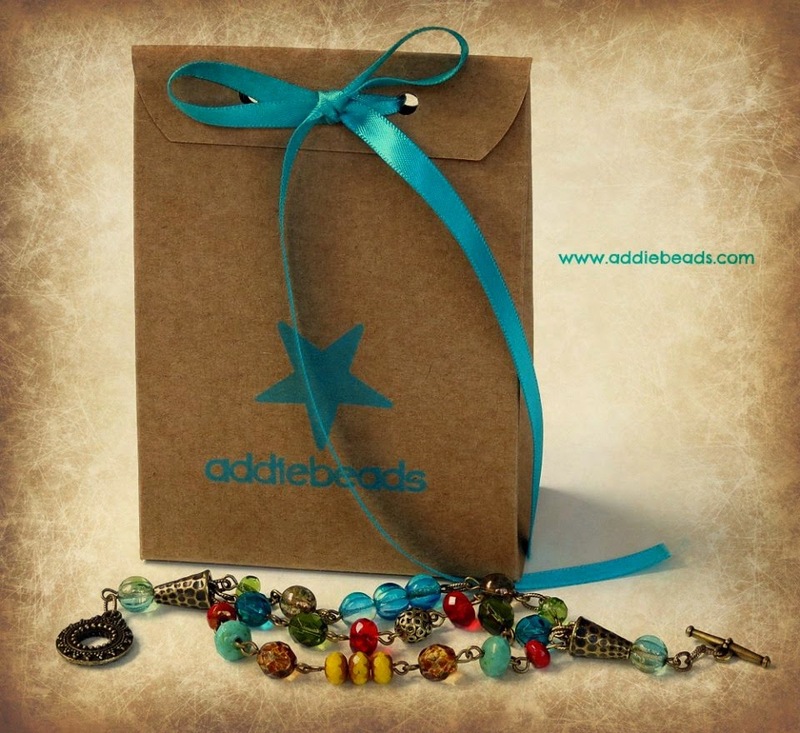 New packaging, new labels and a brand new Addiebeads is coming soon! More on the ‘making’ process in my next post! Thanks to theglassinitiative.blogspot.com and www.alvaandpassion.com for the glass cane photographs. Hi everyone! Its that time of year again – the May craft fair run by Craft Festival in the Royal Marine Hotel in Dun Laoghaire is taking place on May 10th. This year I will be running beading workshops throughout the day! If you fancy learning how to make your own jewellery this will be a perfect introduction to a thoroughly enjoyable and rewarding new hobby! Once you learn the basics of beading you will be well on your way to making all your own bling! I will be demonstrating how to make a bracelet, a pair of earrings and if there is time I will also make some bag charms. The class will be an hour long which will give you plenty of time to make your own bracelet and earrings! The classes are going to be relaxed but very informative. All items made throughout the class will be taken home by participants. 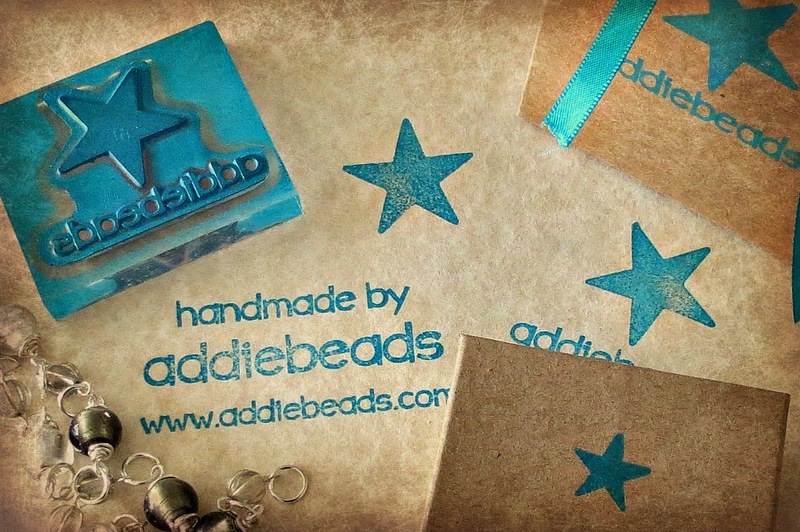 If you think you would like to drop in throughout the day and make your own bracelet and earrings please contact me at addiebeads@gmail.com OR you can secure your place now by booking straight away here in my shop. The class will cost €20 per person which includes all materials. Book now and make sure you have your place for this fun workshop! Children are more than welcome. However this is not a workshop for children. As beads raise obvious health and safety issues with small children, if attending, they will have to be accompanied by an adult and supervised by that adult. I love to make 2 or 3 strand bracelets. I love to layer my own bracelets and at times can wear up to 5 or 6 at a time, but sometimes lots of clasps can be annoying and not so pretty on your arm. So I make multi strand bracelets which means one clasp and then you can add one or two more single bracelets if you wish and it all looks and sits well on the wrist. This is a picture of the first 3 layer bracelet I sold …. I used the method of bringing all three strands through one bead but if you are using strong wire I wouldnt really recommend this method. When the three layers are brought through one bead and then through a few more beads upto the clasp, they then have to be brought back through a couple of the beads AGAIN for security. So you have to bring three layers through the beads TWICE !! If the wire is strong it will be thick and therefore too hard to get through the bead hole. Even if you are lucky enough to get them through it can put too much stress on the wire resulting in wire rubbing and the inevitable break. The method I use now is the perfect solution to making sure your layers are securely finished. I love this method and now use it all the time. I have two strands here for the purpose of this guide. The same method is good for up to 5 strands. Once the strands are ready you will need the following items at hand … two eyepins (2″ or 3″), two beads (from your bracelet selection), two 4mm jump rings, two cones and a clasp. 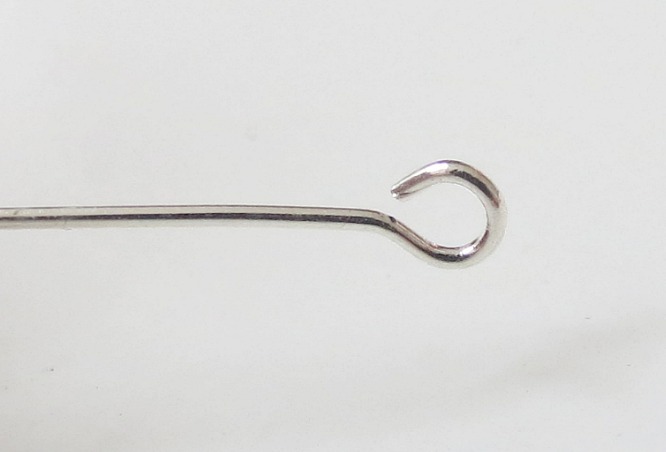 Firstly, open the eye pin …. Place the two strands into the opened eye pin …. Place the cone over the closed eye pin. Slide on a bead, in this case a 6mm gunmetal round which I have used in the bracelet. This bead is very important as it will keep the cone in place and allow you to create a link from the cone to the clasp. You can make a simple loop but I would recommend wrapping the bead as I always feel this is more secure and it gives the piece that ‘handmade’ look and feel. Add a 4mm jump ring and then your clasp. Thats it ! And do exactly the same for the other end. Make sure when making a multi strand bracelet to always use very tiny beads at the beginning and end of each strand. This allows the strands to sit easily within the cone. I would recommend size 8/0 seeds or any 2mm or 3mm beads. If you are thinking of doing a 5 layer bracelet I would recommend an even smaller seed bead and a slightly larger cone. This cone measures 12mm long and 10mm wide and is perfect for upto 3 layers. Anything more than 3 layers will need a longer and wider cone. 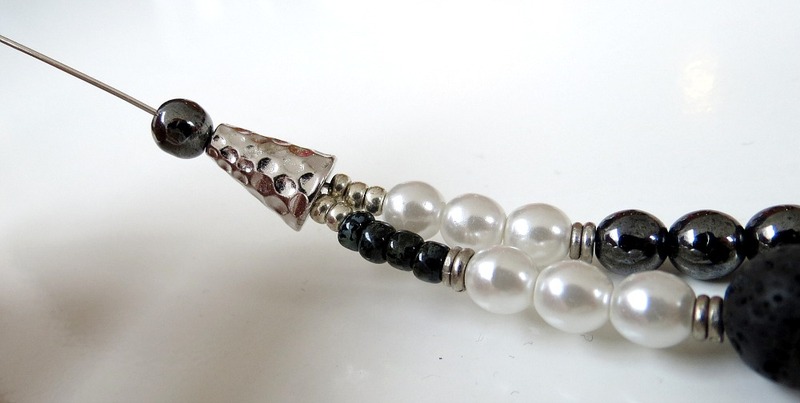 This bracelet is made with a selection of firepolished glass beads, lava rounds, jet and clear crystals and pearl finished glass rounds and is finished with a beautiful ‘bali clasp’. If you have another way of making a layered bracelet and feel like sharing please comment below ! I love to hear everyone’s ideas and tips ! Each day as I log in to my online life of beading and jewellery making, I find myself engaging with a huge variety of people ‘out there’. A comment on a Facebook post here and there can lead to full on conversations and even debates, resulting very often in further connections with the same people over and over again. As my online community has slowly grown and a following developed for Addiebeads so too has a small inner circle of ‘friends’. I call them my onliners! I can count them on one hand but they are always there and they are now firmly placed in my everyday online interaction. They are supportive, they are the sharers and they follow and show an interest in what I do. They are always on hand for a bit of advice, the odd clap on the back and are genuinely supportive. I am talking about the real sense of community that exists online. Alongside online friendships there is also online networking. Networking in cyberspace is powerful when you have an online business. Just like a bricks and mortar business where you befriend the shop up the road or you use local businesses and services around you, I too here on my laptop do exactly the same. I have found everything I need online. From printers to website designers, to social media experts, blogging experts, online learning. Anything my business needs I have found it through networking online. But its the friendships that I have made online that keep me here. Their unending support, the laughs via Facebook chat, the banter on twitter, the odd moan via email and lets not forget the skype sessions! I have had many a skype call supposedly to demonstrate a beading tecnhique where the conversation completely missed its original purpose! I have been on the receiving end of many an online crisis and have helped out in any way I could and from these experiences friendships are born. There is always then the question of meeting your online friends in the real world! At first or in the early days I would have hesitated slightly. Its almost like the ‘big reveal’! But I have learnt that you cannot hide forever! When I started out I loved the idea of being sort of anonymous – I will be honest it was just what I needed at the time. I had finished a very ‘full on’ and demanding job and I felt I just wanted to disappear for a while. I wanted to go under the radar. And I did. But the friendships that developed along the way brought me back to the real world and as I began to meet each one of these wonderful people I began to enjoy the best of both worlds. Online or offline – friendship is key. Friendship keeps you motivated, grounded and challenged. Friendship is support. Bracelet kits – how many for the National Ploughing Championships? How many should I make? How many should I bring? How many will I sell? This question has me tormented. How much stock? Is there a formula based on the footfall? There will be hundreds of thousands at it. What percentage will come visit my stand and then what percentage of those will make a purchase? Any? What if they cant find our stand? What if our Marquee is at the end of the arena – away from the main thoroughfare? Its a big investment of money AND time. This week I am concentrating on my beading kits. I thought this would be so straightforward. Just a matter of popping a few beads into a bag. Bobs your uncle! I realised I have to have proper packaging. I need one of those little fold over card thingies on the plastic bags. Which sounds doable but that just leads me into designing that little piece of card. That big ‘perfection’ monster is firmly planted on my shoulder. Why oh why can I not just stick a bit of card at the top of the bag? I could do it myself for heavens sake. No no no no …. the paper must be brown, the font … the colours …. and on it goes. I am now totally distracted with labelling, branding and making sure I have the right ‘look’. Here are two pics – the first is how my bracelet kits look like at the moment and the second is what they might look like when I decide what to place onto the blank card! All suggestions welcome and remember there is a blank canvass on the reverse of the bag card too! Apart from such distractions I did manage to assemble over 100 bracelet kits in various styles and colours. So that’s good. I have just spent a beautiful few days in sunny County Wexford at a mosaic workshop and thought I would share a little glimpse of what I got up to …. I arrived at Smidirini Mosaics to be greeted by the lovely Maedhbh Brosnan who welcomes you into her home with open arms, coffee and scones! There were four of us – Sharon and Linda were making mirrors and Kathleen was doing a wall hanging and after a lovely introduction to each other we all started into our projects. Maedhbh’s enthusiasm and passion for mosaic is infectious. You could not but want to mosaic everything in sight when she is in your company. She is so animated when talking about her passion. She loves nothing more than to share everything she knows and her mission as she says is to spread the word!! The positive energy oozes from this woman! I had decided I was going to mosaic a small table. I had been looking for a small table to use at fairs but could never find what I wanted. I wanted to use my logo as my design and I settled on this plan because I thought as I am only learning that it would be an easy ‘pattern’ to do. Well how wrong and clueless was I !! I had to make apologies for being ever so slightly ‘dislexic’ (my excuse) or ‘confused’ as I found working with angles or even ‘right’ angles quite challenging. Even the cutting of angles was not easy. The precision involved in the cutting of each piece can make mosaic a slow process. It is something you can completely lose yourself in. Looking at the vacant shape waiting to be filled and knowing what you need to pop in there is the easy bit – its the cutting of that little piece which could end your love of mosaic! I found this intricacy completely absorbing and would have quite happily mosaiced a mountain! Nothing has to be perfect but unfortunately this is where I struggled. I found every little shard of glass tile needed had to be as near as perfect as I could get it. This is where my obsession with mosaic has started. I realised I am at my happiest when faced with ANY sort of challenge. To the end of the line, to the end of the world I would go to find the ‘right’ piece for my star! But being a perfectionist and looking for the exact piece makes for a slow pace. At the end of day 1 – yes a FULL day I had only gotten this far …. This is crazy paving style mosaic where random pieces are fitted together into a shape or space. Tiles are broken and placed almost like a jigsaw puzzle. But at some stage the pieces you have are not going to work or fit into particular little gaps so you also have to cut tiles to fit. Once the star was completed everything else would be fairly straight forward! The only thing I was disappointed with at this stage, as the day drew to a close was that I hadn’t completed the whole star. When I returned the following morning for the next session I took a little wander around Maedhbh’s home where she lived all her life with her parents and three sisters. She kept us entertained over the weekend with many a story of her late parents and the history of the house from the ever changing garden which once unbelievably had a tennis court back in the ’70s to all the quirkiness indoors. Vintage lampshades, old clocks, dressers and old tables all now sitting side by side with an incredible collection and stash of tiles! Time has stood still here and I love it. It was just so peaceful. I completed the star and now had to think about the background. I wanted to keep it as close as I could to the logo so a gold bronze tile was picked and after a long period of dithering and procrastination I was off. Once the colours are chosen and the plan is laid out it really is straight forward after that. Or so I thought! It was the merging of the gold into the teal star that got myself and Maedhbh working closely together. I was bossing her (poor Maedhbh) and she was doing her best to facilitate my obsession with perfection! She was now on hand to help with all the tiny little pieces I had to cut. We got the giggles and once the giddiness sets in so does the inevitable odd curse but we hurtled onwards and Maedhbh never once wavered in her patience in helping me strive for perfection! She did gently tell me that ‘nothing is perfect Mary’ and then she changed that to ‘nothing has to be perfect’ … oh we did laugh! There was also the odd bit of slagging about how I ‘hogged’ the teacher for the best part of day 2! Towards the end of the day as we all got nearer and nearer to completion the excitement was mounting. I couldn’t wait to see everyone’s work. It is lovely to watch 4 blank canvasses transform into something unique and so personal to each individual. We all had completely different styles, tastes and ideas. Sharon from the Bead and Button Emporium brought an old pine mirror and transformed it with her love of flowers and hearts …. Linda who worked so quietly and methodically produced a true mosaic piece. Beautifully put together using matt ceramic tiles …. (yep that’s me taking the pic!). Kathleen took inspiration from her love of the sea and created this beautiful wall hanging …. And I finally get to take a pic of my finished little table with my Addiebeads logo! This little table will be brought to every fair to add to my display. Its a good idea to add different heights when displaying jewellery or beads and this is small enough to place on top of a larger table and not take up too much of that table space. All that is left to do now is grout the tiles. You have to wait at least 24 hours before grouting. This is just the start of mosaicing for me. I have plans to do lots more. This was a learning weekend. I am now going to think about blending mosaic and beading and see what I can come up with. As is always the way with learning something new …. it starts a new chapter. A huge thank you to Maedhbh at Smidirni Mosaics for a truly inspiring weekend. There is nothing like spending time with like minded individuals and sharing a creative space. Meeting new people, making new connections and sharing interests and ideas is what really gets the creative juices flowing. A crimp is a small ‘soft’ metal bead that can be ‘clamped’ or squished with a flat nose pliers. They come in either round or tube shape and in all metals. My preference is the tube crimp. 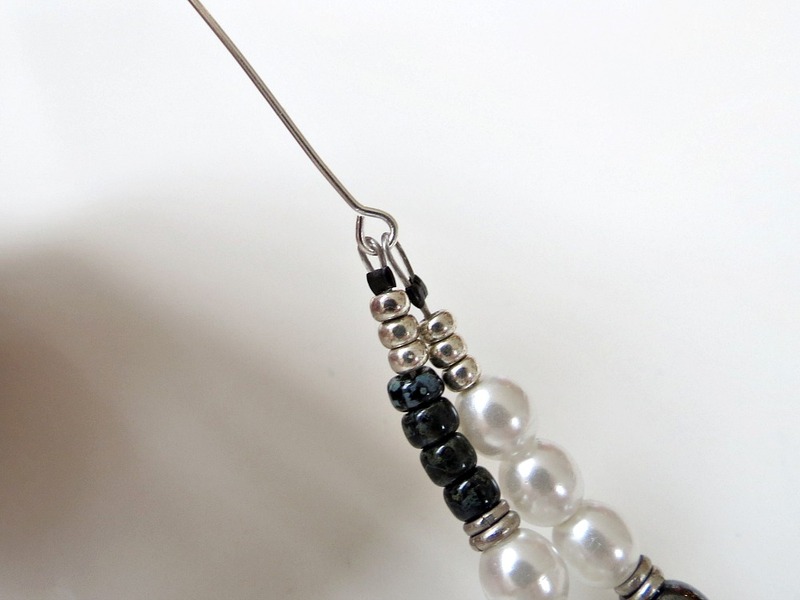 Crimping is creating a ‘stopper’ at either end of your bracelet so your beads don’t fall off! Yes sounds sort of basic but it can be tricky. This is how I crimp. You will need a crimp (more than one if you are going to practice), a length of tigertail and a lobster clasp. You will need enough wire to practice crimping – about 20cm. You will also need a wire cutter (not in photograph). 1. Thread the wire through the crimp and then add on the clasp. 2. Bring the wire back over the clasp and through the crimp to create a loop. As you make the loop smaller by pulling on the loose end make sure to keep the wires side by side so they are ‘flat’ as in the pic below. 4. Using the flat nose pliers, clamp down on the crimp, making sure both wires are ‘flat’ (lying side by side and not crossed over). SUMMARY – place crimp on wire, add clasp, take wire over clasp and back through crimp. Tighten wire to create small loop. Keep wires flat. Clamp. While you are learning to crimp and practising I would suggest using a long length of tigertail. When you have finished your crimping you can simply use the wire cutters to clip the wire and start again! Keep at it until you are happy with the size of your loop and that the two wires are sitting side by side. Practice makes perfect! When you are happy with your crimping technique you can then start to add your beads. Crimping at the the end of your bracelet is exactly the same except this time you will be adding a jump ring instead of a lobster clasp. You can then close the lobster clasp into the jump ring. If the jump ring is an open jump ring it can be added AFTER crimping. Beading in the sunshine …. Oh I am loving this weather! I don’t want to go to the beach, I don’t want to go on any trips – I just want to sit in my little garden! Today I am working in the garden – not gardening but I am attempting to get some beading done and hopefully edit a blog I am working on. But sitting here in the shade I am easily distracted with all the things I need to do in the garden, the beauty of the blue skies, the heat on my bones and the selection of colours all round me. I have the simplest of gardens. I have filled it with easy to care for plants and shrubs. My favourites are my bamboos which gently rustle in the light breeze. They are green all year round and come into full glory in the summer months. I’m trying hard to keep my eyes on the beading board but before I know it I am up with the camera and taking photos! The blog I am supposed to be working on with a guest blogger has soon taken a back seat and I am thinking I will squeeze in an unrelated post before I publish the ‘real’ one! Nothing like going with the flow …. Little thrushes and sparrows are flying low in and out of the trees but never visit this little house. The garden is a hive of activity – midgets, flies, wasps and bees all flurrying about … when you just sit still you see and hear it all. Nope I’m not getting much work done! This is a cute little table I got recently in Ikea for €10! I love it and plan to go back and get a few more. I was going to paint it but I think I shall leave it as it is and let it age and blend in with the rest of my rustic garden. I say rustic some may say ‘neglected’ …. Neat green lawns, sharp lines and tidy flower beds are not for me. I have left this little patch to form its own shape and style. I have allowed it to be as natural as my organised mind will allow it to be. I have intervened with painting my shed and chairs ‘trendy’ colours but the rest of my garden is lovingly neglected! For now its back to beading in the sunshine! I hope you are all enjoying this wonderful sunny spell ! Yesterday I did a course ‘blogging for business’ which was presented by Aine Bermingham of Utter Digital. I have enjoyed blogging about beads and jewellery for the last year or so but have also found it a challenge. We are constantly told ‘google loves blogs’ or ‘blogging is good for SEO’ but I needed to understand this better so I could blog the best I could. The course took place in DIT, Aungier Street and kicked off with the usual introduction around the table. One thing it seemed we all had in common was that all of us were finding the demands of social media to be the most time consuming aspect of our businesses. And here we all were about to add blogging, another activity, to the already long list!! Aine brought us through an outline of blogging which explained what blogging is and how and why it is essential to our business. The one word that I took away from the workshop was CONTENT. Its all about content! Google will reward us if we have good content. What does that mean? Well if our content is relevant, real, informative and unique google will take note!The correct content can see your ranking move in the right direction in the search engines. This is afterall what all businesses want. Everyone wants to be on page 1 !! Aine made it clear about using keywords, the right amount of keywords, not ‘stuffing’ the page with too many keywords! She spoke about using clear and concise text and fonts and keeping your branding consistent throughout your posts. I learnt that blogging is to entertain, inform and develop trust with your readers. There were a wonderful mix of ladies on the course including a candle and soap maker, a calligrapher, a florist, an allergy specialist, and a graphic designer. We were all there for different reasons but we all wanted to learn how to blog properly to enhance our business. Liz from LizzieB.ie who makes beautifully scented soap and candles wanted to do a bit more social media in general. Josephine Hardiman who is a calligrapher and artist wants to take her full body of work online and through blogging could inform and educate her following. Deirdre from Kays Flower School and Brooch Bouquet Training is finding online tutorials are working well for her business and wanted to learn more about blogging which ties in perfectly with online tutorials. I am now going to try and put all my new blogging knowledge into my future blogs which will hopefully come a bit more frequently! Why not check out some of the above businesses and check out their top quality work and lets all try to shop local, buy handmade and buy Irish! Lets all make a difference! Branding – whats in a name? Lets talk branding and packaging. You cannot have one without the other. This topic comes up all the time for crafters. Where to get packaging, what to get, box or bag, design your own or get a designer, how much will it be. All these questions are constantly on the minds of crafters whether you bead, knit, crochet, make candles or make pottery. The worry will always be how to keep the price down as it is another ‘add on’ when it comes to pricing your product. 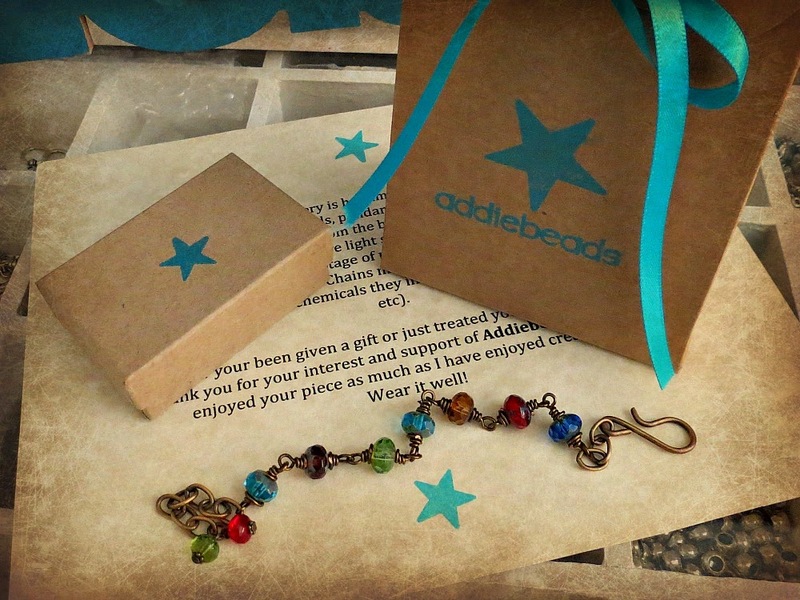 Since I started the Addiebeads journey I have been slowly getting closer and closer to finalising my packaging. But when it came to what to put on the packaging as in the name the whole question of branding started. Do I put the website address on the box or do I just use the name without the .com? And if I am only using the name am I happy to not have a picture to go with it. Should I have a symbol or a motif that represents ‘the brand‘ … it is endless! At times too much to think about. Over thinking can happen and I found myself going round and round in circles. But I soon realised that in order to develop a brand you have to know what your product is and how to relate that out to the masses in one small pic. I am selling handmade beaded jewellery but so are thousands of others. So I am trying to get across with my logo what sort of handmade beaded jewellery it is. I design and make an earthy style of bling. I use glass and crystals but not in a glitzy way. My designs are more earthy, tactile and personal. So my logo and packaging have to reflect this style. This pic or logo will after all be everywhere my product is. So I had the name but then I began to realise that I also needed a pic or a symbol, something that would represent me and Addiebeads. Beads were the obvious choice. A picture of beads maybe. And if I did choose beads which bead? what colour? what shape ? This was hard. So I began to think about the name and what it actually meant. Lots of people ask me where the name ‘Addie’ came from. In fact lots of people think it is my name! Addie was my mother’s name so it seemed perfect. The star came from my lifetime fascination with the heavens. Addie had passed away when I was very young and as a young child I was consistently told she was in heaven. So for me using a combination of her name and where I imagined her to be was how it all came about. I was looking for a name AND a symbol. Once I concentrated on the name the idea for the star soon followed. I am also in love with the moon but a moon symbol just didn’t appeal to me. So now I have the name and the star! The coming together of a ‘brand‘ idea had well and truly begun. Putting this notion of Addie and the heavens into a brand was a challenge. I didn’t want it to be one of those heavenly mystical or ethereal images. I want something more straight forward and concrete. More lines and shapes than pictures. At the end of the day it has to be something that will be recognised. So I have settled for a very clear shape as opposed to an image. My next challenge will be moving this idea into one single digital image/logo. For this I am going to need an expert. But I feel I have done most of the work which hopefully will cut down on costs. I still am unsure whether to go with “www.addiebeads.com” or “addiebeads” on the packaging. So I think it will have to be both. So for now I am working out how and where to place both titles. Once you have decided on your name/brand the packaging is the next thing. Unless you have somewhere to start from this can be a nightmare. I knew it had to be recycled packaging. I knew it had to look and feel ‘organic’. But I also wanted it to be pretty. The colour had to right. My favourite colour is turquoise and any shade on its spectrum. So naturally the text, star and ribbon would be teal or turquoise! But even knowing what I wanted did not make it any easier to source. I could have continued to ship out my jewellery in voile bags but I wanted to present it in a unique way. I definitely wanted to brand Addiebeads. It was through the packaging journey and trying to source it that I realised, for me, creating my brand is hugely important. I need my product and what I do to stand out. I want Addiebeads to be recognised as Addiebeads. I have not spent a fortune on my packaging. Until I am absolutely sure about the design and my logo I am happy to use products that are readily available. I have customised the bags and boxes with stamping. I used a wonderful packaging company called Self Packaging who are based in Spain and carry a vast range of shapes and designs. They come flat packed so there is a bit of assembly involved. I bought some lovely custom designed stamps from Clarise Crafts where I found the service and quality of stamps top notch. I would recommend, having been through it all, concentrating on getting your logo first. Get some sort of a vision for your brand. Having a tiny business does not mean we should not be concerned with branding and logos. There are so many beaders and jewellery designers out there I felt it vital to have my own ‘image’. Otherwise I was disappearing into the beading millions! The shipping out of my jewellery now involves the assembly of the jewellery box, the careful stamping of the star and name and then the final addition of the narrow teal ribbon which brings the whole look together. I look at my packaging now and feel it is ‘real’, it means something to me. The time and effort gone into it has been well worth it. I am very happy with it! Are you concerned with branding? Do you have a story behind your name? Are you happy enough to go with nice packaging with only your name? What do you think works? Please share your packaging ideas and whether you think branding is important for the small craft business.